Here is a product coupon I can honestly say I have never seen before! 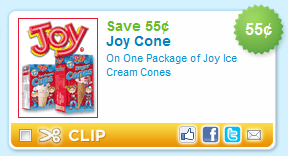 Save $0.55/1 package of JOY Ice Cream Cones. Fun! I see it under zip code 43065 if you don’t find it under your zip. I found these at Walmart for $1/ea which would make a box just $0.45 after coupon! These are in every supermarket by me (NY). They’re one of the few brands of ice cream cones around here. They’re usually very inexpensive, so they’ll probably be free (or close to free) with this coupon doubled!